Government departments like the Foreign & Commonwealth Office are just beginning to understand the value of hackdays, or hackathons. A hackathon that recently helped recent flood victims shows what can be done, says Gerard Grech, CEO of Tech City UK. With more than 30 co-working spaces in Tech City alone, London’s tech community knows a thing about collaboration. Across Shoreditch and beyond, people come together on a daily basis to exchange ideas, bounce concepts around and gather inspiration. And when those people are programmers working towards a shared goal, the word ‘hackathon’ is often attached. A hackathon is a gathering – typically involving software developers and computer programmers – who join forces for a short but dedicated stretch of time, and pool their expertise to work on a specific project, finding innovative ways to build or enhance services and applications. Usually restricted to just a day or sometimes a weekend, hackathons are intense sessions and, as such, the outcomes are inventive and original. Earlier this month, following the extreme weather and flooding that severely affected parts of the country, the Government called on Tech City UK as a convening hub for digital innovation, to mobilise the tech community to help. In less than 24 hours, Tech City created #floodhack, appealing for volunteers from across the tech community to give up their Sundays and apply their programming skills for the benefit of flood victims. On 16 February, more than 200 developers signed up and came together at Tech City’s Google Campus to devise digital solutions to aid impacted communities. 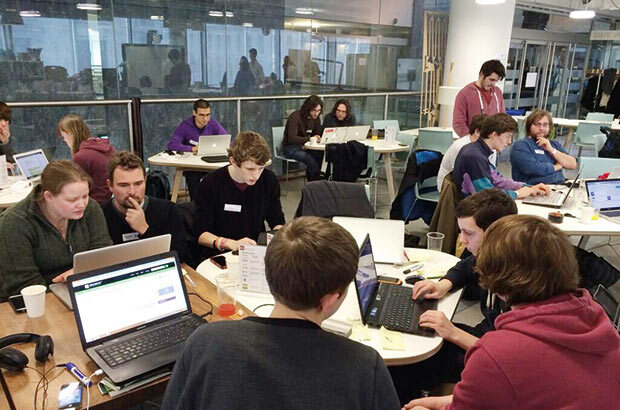 Engineers and individuals from the likes of Google, Facebook, Conversocial, Twitter, Microsoft, Datasift, Twilio, Nominet Trust, TechHub, SKHub, Shoothill, Session Digital and Inviqa also leant invaluable support and helped make the hackathon happen. Don't Panic – A system that allows people with and without web access to request and receive help, ranging from the delivery of materials, to local information. The system will record data for future analysis and real-time response planning. FludBud – Using Twitter to spread the word about floodvolunteers.co.uk; locating Twitter users near flood affected areas and tweeting them information about floodvolunteers.co.uk and potential volunteers in the vicinity. Who do I call when I have a power cut? – A service that lets people look up their Distribution Network Operator based on their postcode, connecting them with the right people when their power is cut. As the success of #floodhack demonstrated the power of the open data movement, there were calls for Government to continue to release more data to spur the creation of future innovative public services. If and when this happens, one thing is certain: there’s a thriving tech community waiting to collaborate. “Open Data” and “the Foreign & Commonwealth Office” (FCO) are not phrases that you see together in the same sentence very often. Yet the FCO has unique information in its archives, like details of every treaty the UK has been a signatory to since 1834, and generates information on a daily basis on things like the human rights cases in countries. FCO Alerts – an android app providing customisable alerts from the FCO travel alert webpage. TINATAPI – an API with information useful to travellers such as areas of risk, travel alerts, and human rights information. Relations Tracker – a heatmap for analysing the international relations of the UK using weightings of data such as treaties signed, membership of international communities, and trade levels. FCO Data On the Operating Table – a challenging but constructive analysis of what the FCO needs to do to improve the quality of its data, and what other data would be useful for developers to have.